Getting new blinds had an unintended consequence. I walked into the living room and discovered a new star in view. A giant street light across the way suddenly got a new look. Through the sheer fabric of the blind, the light burst into a star pattern. It’s actually quite dramatic looking in person. However, it presented more of a photographic challenge than I expected. Through the lens, the beams of light spreading from the center light were more muted than with the naked eye. I tried shooting with the inside lights on to see if it helped. It just made the blind more apparent. I tried shooting with longer and shorter exposure times. Nothing seemed to make the light beams stand out the way they do in real life. I tried many adjustments. Making the light brighter made the blind in the foreground brighter as well. If I were really industrious, I would try using Photoshop Elements to select only the light beams and lighten them individually, but I suspect I would end up with bright spots in the blinds since they stand in front of the beams. It’s somewhat ironic that the object that creates the effect I want to capture is also the object that stands in the way of capturing it. This is much like life. Take having a job. Having an income is what allows us to do all the things we want to do in life since, let’s face it, it all costs money. But having a job also takes the vast majority of our time, leaving us with portions of weekends and a few weeks vacation in which to jam all of those things we enjoy doing. Or look at having a home. We want a nice place to live where things are comfortable and maybe even aesthetically pleasing. Yet, having a home takes work that takes time away from enjoying the home as well as more time away from doing things away from home. There are not too many things in life that aren’t a trade-off. I suppose it’s a reality that you can’t have your cake and eat it too. When we embarked on our little adventure over a year and a half ago, we envisioned having very little in the way of worldly goods. Just enough clothes for me to have something to wear to work events besides a few days worth of casual wear. A handful of dishes–just enough for one meal at a time. Our bikes. Our camping gear. The computer gear I need to work. My camera gear. And the open road. We thought we were ready to give up on having a home at all. But, here we are, with new blinds, accumulating the trappings that not so long ago we were getting rid of. The truth is, I like the blinds. But, I find myself with mixed feelings. Are they a nice decorative touch or the final sign that we are not going anywhere? 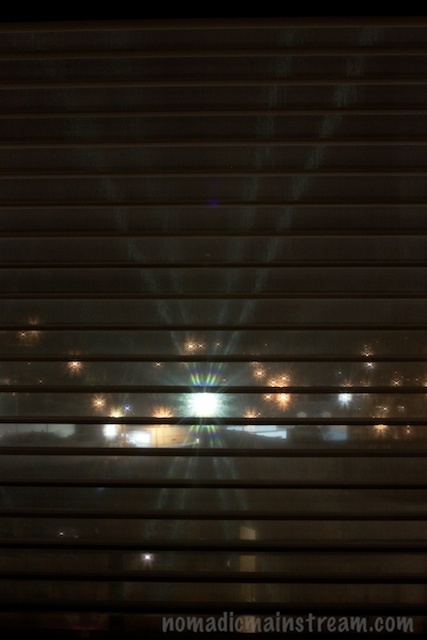 This entry was posted in Chattanooga, Home, Photography and tagged landscape photography, Light beams, Window blind. Bookmark the permalink.